For anyone working at a job that starts before 5pm or is afflicted with a perennial case of The Mondays, coffee is a vital part of the day. The ongoing search for coffee is something the developers at Apple obviously considered when they recently rolled out the iOS 9. 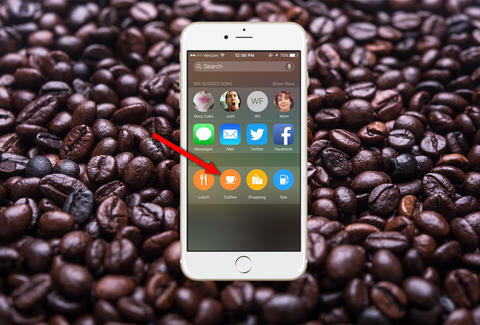 This update added a major new feature for the caffeine junky: the coffee button. While this feature doesn't automatically deliver coffee to your office or dispatch a doctor to administer a cold brew IV, it does provide an easy way to view any and all coffee shops nearby with the push of a button. By way of a simple right-swipe at the home screen, you'll also find a search bar, recent suggestions from Siri, and get directions to nearby restaurants, gas stations, and places to shop. The only downside? Apple Maps is the default app for getting from Point A to said coffee shops, so we suggest copying the address from Apple and pasting it into Google, if you prefer Google Maps. You can also make coffee at home, but who has time for that?